Quilling is the art of rolling narrow strips of paper into coils or scrolls, and arranging them to form elegant filigree. In this project, you'll learn how to use a toothpick to roll coils and scrolls, then pinch, shape, and arrange them into decorative patterns. White or colored paper can be used—even pieces of brightly colored junk mail work well. 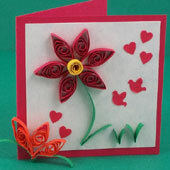 Quilling can be done with simple tools and supplies, and almost anyone will get beautiful results. 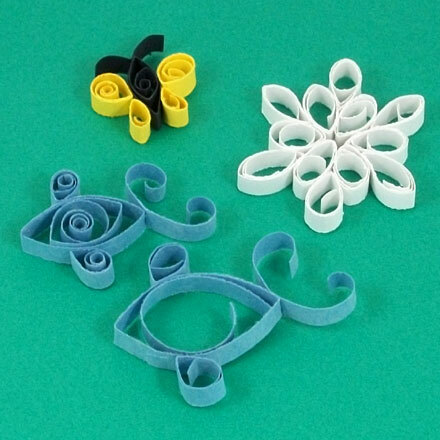 Save those scraps of paper and have some fun quilling! Extras: Included at the end of this project are quilling project sheets for snowflakes, flowers and fun creatures, along with a brief note about the origins of the art of quilling. 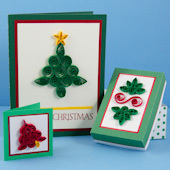 Related craft: For more quilling designs in holiday season reds and greens, see the Christmas Quilling craft project. Paper for making narrow strips: computer paper, craft paper, construction paper, etc. Optional: Craft knife, paper cutter, tweezers, markers, beads, and ribbon. 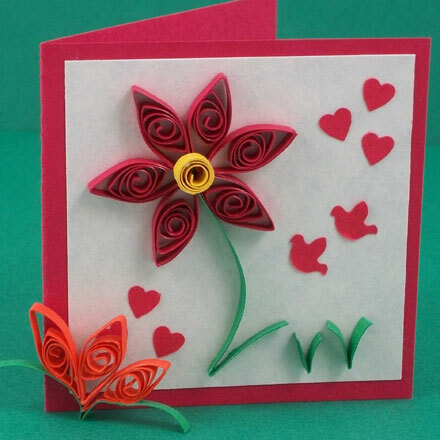 Quilling is most often done with 1/8"- (3 mm) wide strips of paper. Beginners will find that ¼"- (6 mm) wide strips are easier to handle, and younger children will do best with ½" to 1" (12 - 25 mm) wide strips. Use scissors or a craft knife to cut twenty or more strips. You can also use a paper cutter or trimmer for cutting strips, and some inexpensive paper shredders make ¼"-wide strips. Tip: As an aid in cutting strips, download and print a paper strip cutting guide on colored or white computer paper. 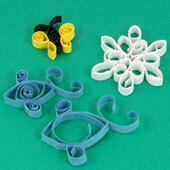 There are over thirty basic quilling shapes. Most of these shapes are based on a simple closed coil or use the technique of winding. In this project, you'll learn how to make these twelve shapes. To wind a coil, you will need a round toothpick and a strip of paper. Moisten your thumb and index finger. Place the top of the paper strip against the index finger. Put the toothpick across the top of the strip near the top. With your thumb, curl the paper over the toothpick. This will start the coil. Without moving the toothpick, use your thumb and index finger to wind the paper. When the paper is completely wound, carefully slip it off the toothpick. Tip: If you can't find a round toothpick to use as a winder, wrap a little masking tape around a square toothpick. Other things to use as quilling winders are round pencils, sewing or yarn needles (1 or 2 mm), knitting needles, T-pins, or a cocktail stirrer. Children may find a round pencil easier to use as a winder. Skip this step if you are making an open coil, one of the scrolls (heart, V, or S), or the V.
Spread out a sheet of wax paper to put your glued coils on. Use a white glue that dries clear, and apply a dab with a toothpick on the inside of the coil's tail end. Hold the coil loosely and let it expand to the desired size. Then press the glued spot against the coil and hold for a few seconds. Your coils can be sized more easily by using a sizing aid. Anything ring-shaped will work—washers, curtain rings, small bottle caps, etc. You can also make a wooden frame for sizing by gluing two toothpicks across two more toothpicks. Use a small round object of the target size to space the toothpicks. Buttons and coins work well. Each of the basic quilling shapes starts with a winding; then they are sized, and some are glued. Pinching and curling are used to form other shapes from simple closed coils. Practice making each shape before trying a quilling project. Open: Wind a strip, but stop about 1" (25 mm) from the end. Let the coil spring open. Do not apply glue. Closed: Wind a strip to the end. Before gluing, allow the coil to expand to the size you want. Tight: Wind a strip to the end. Glue the end without letting the coil expand. Hold it firmly until the glue sets. Large: Use a pencil for winding. You may want to glue the coil before taking it off the pencil. For even larger coils, use dowel rods. Teardrop: Wind and glue a loose coil. Pinch one side of the coil. Eye: Wind and glue a loose coil. Pinch on opposite sides of the coil. Petal: Wind and glue a loose coil. Pinch one side of the coil, and curl the point in one direction. Leaf: Wind and glue a loose coil. Pinch on opposite sides of the coil, and curl the two points in opposite directions. Each of the scroll shapes starts with one or more windings. Pinching and curling are also used to form the shapes. Practice making each shape before trying a quilling project. Heart scroll: Pinch the paper strip in the middle. Wind each end toward the middle. The coils are allowed to spring apart and are usually left unglued. The scroll may be glued where the coils meet. V scroll: Pinch the paper strip in the middle. Wind each end away from the crease. A closed V scroll can be made by gluing the middle of the V together. S scroll: Wind one end of the paper strip just past the center. Release and turn the strip. Wind the other end just past the center, and release. V: Fold a very short strip of paper in half. Curl the ends away from the fold. 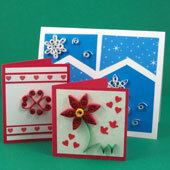 The real art of quilling is when you combine a variety of quilling shapes to make pictures and decorations. Make six eye coils or teardrop coils and glue them together to form a flower with a tight coil center, or make a vine with a strip of green paper and several teardrop coils. The possibilities for combinations are endless. Assemble your designs on wax paper, using a toothpick to apply the glue. After a design is complete, you can use it to decorate anything— a gift tag, card, picture, pendant, napkin ring, jewelry box, etc. Use glue to attach your decoration. Tip: For your first coils, start with 1/8" paper strips that are 4" to 6" long and form closed coils that are 3/8" to 1/2" in diameter. The closed coils can be shaped into teardrop, eye, petal or leaf shapes and combined to form any number of designs. Choose the quilling project pattern that you want to use. Each pattern lists the width, length, and color of the required paper strips, the shapes used, and an outline of the pattern. Make the shapes and assemble the design. 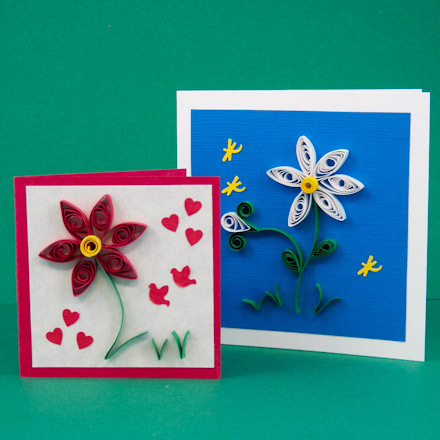 These projects are just some simple examples of how to use quilling. After you complete these projects, you can come up with your own ideas and designs. One of the favorite uses of quilling is as a border on a mat or to decorate calligraphy. It can also be used to create three-dimensional figures and miniatures. Quilling's uses are endless! Note: All of Aunt Annie's quilling projects are designed for a toothpick winder, except for the chick in the Creatures project. It uses a pencil as a winder for the head and the body. Younger children will find these projects easier to do with a round pencil winder. When using a pencil, make the strips for the snowflakes ¼" wide and double the suggested lengths. Tip: If you don't have colored paper, color the coils after the design is complete. Just go over the top edge of each coil and scroll with the color needed. That's it! Have fun quilling! Did you know that quilling dates back centuries? It first appeared as a substitute for metal filigree during the 14th century. It was originally known as paper filigree or paper rolling. The craft got the name quilling during American colonial times. Back then, feather quills and porcupine quills were used to wind the coils. This is an old craft that has been popular at various times in history. It is becoming popular again and is a craft well-suited for both kids and adults. 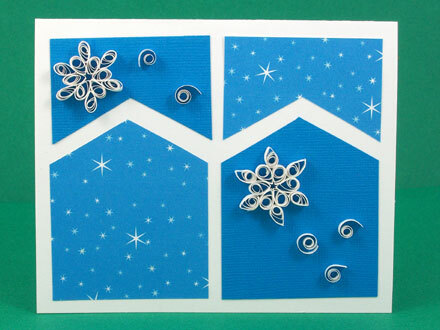 Tip: Make a simple Four Patch Card, then decorate it with quilled snowflakes. 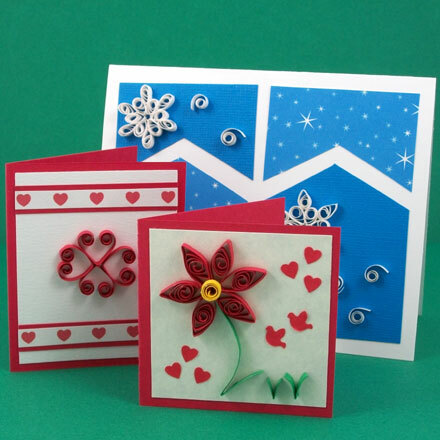 See details in Fall and Winter Quilling Cards. Tip: Get a variety of looks using the same quilling motif, like this daisy, by using it in different colors and arrangements. Tip: Quilling can be done with ¼"-wide strips of construction paper. The right two designs were rolled on a pencil, and the left two on a toothpick. Notice how the right fish is larger: coils are looser when made with a pencil winder. Related craft: Add quilling to your holiday crafts, see the Christmas Quilling craft project for designs and ideas. Tip: Combine quilling motifs to create a picture. 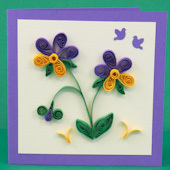 Tip: Almost any greeting card can be enhanced with quilling. 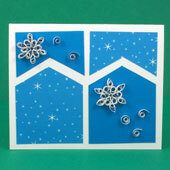 Check out the Greeting Card Tutorials for a wide range of greeting card designs.